This 1790's historic register colonial manor house loacted in suburban North Wilmington, DE. And 20 minutes south of Philadelphia, PA, near 1-95 & 1-495. The Phila. airport is 15 min. away. All Brandywine Valley attractions are 10 - 20 min., including Winterthur, Longwood, and the Brandywine River (Wyeth) Museum. The 2 rooms and 4 suites have AC, cable TV, VCR (free use of movies), phones (free local calls), queen-sized beds, comfortable chairs, private baths, and seasonal garden hot tub. The full breakfast is served in the dinning room. The Inn's Mobil 3 Star rating reflects the amenities, ambiance, comfort, and high service standards of the owners / innkeepers. Rates are, Double Rooms: $85-$99, Suites: $95-$119. All major credit cards are accepted. Smoking on the porch only. Children 10 and over; no pets. Special attention to business traveler's needs, including exercise room and a frequent flyer program. Ambiance of the 1850s, with amenities, comfort, and service of a 1st class 1990's hotel. This and other Wilmington Bed and Breakfast Inns can be found here in The Register. 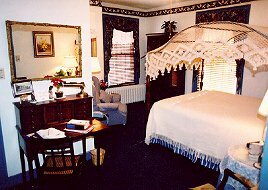 Romantic Country Inns, Getaways and B&Bs offer a great Deleware lodging alternative to big hotels.